The Broke and the Bookish : Regarding Jana and "501 Must-Visit Destinations"
Title and Author: 501 Must-Visit Destinations by David Brown, Jackum Brown, Kieran Fogarty, and Rebecca Walder. Publishing Info: Published by Bounty Books, 2009. How I got this book: This beauty was $10 at Borders! Couldn’t pass it up! Why I read this book: I love geography and beautiful pictures! Welcome back to school, college students! Can you believe it’s September already? I feel like it was just yesterday that I was laying poolside aboard the beautiful cruise ship I spent 7 days on, floating around in the Caribbean this past summer. Now it’s back to the old grind—shopping for textbooks on Amazon Marketplace, walking the crowded halls of school, going insane reading syllabus after syllabus. The weather is cooling off and with the first breezes of autumn fast approaching; I’m hit with the desire to be anywhere but here. I think it’s safe to say that we’re all wishing we could hit re-wind and get a month of summer back! This seems to happen to me every year, and when it does I go to the travel books (or watch Samantha Brown). It’s one of the cheapest ways to escape for a little while! This book covers every possible vacation spot I could think of, and then some! It covers Africa, the Americas and the Caribbean, Asia, Australasia and Oceania, Europe, and the Middle East. The pages all have color-coded tabs that tell you where you are. Each destination gets one page with about 4-6 paragraphs of text and a beautiful image or two. There’s also a sidebar for each location that tells you a number of different important facts including any of the following: when to go, how to get there, why it’s important, what it is, any notable geography, any yummy foods you should try, what to do while you’re there, where to stay, legends, taboo, entrance fees, and any social etiquette you should be aware of. The main body of the text discusses the history, culture, and other interesting tidbits. I learned a lot on my journey with this book! Let me highlight some of my favorites. Did you know that Lake Malawi has the largest variety of freshwater tropical fish in the world? In Egypt, women should cover their knees and shoulders in public. Cat Island in the Bahamas is where Columbus first landed in the New World. For all you pink-lovers out there, visit Barbuda in the Caribbean! They have a pink sand beach! Canada has it’s own serpent-like creature lurking around the waters of the Lake Okanagan. Sightings have been made at least once a year, unlike the Loch Ness Monster. They also have a Sasquatch-like creature creeping through the islands of God’s Pocket. I had no idea that the Florida Everglades is the only place on earth where alligators and crocodiles cohabit! While we’re in the USA, let me interject and inform you that a visit to Café Dumonde in the French Quarter of New Orleans for Beignets is a MUST. Seriously. And no, this is not mentioned in the book. I just thought you needed to know. Ok, moving on. Welcome to Asia! Did you know that the Buddhists believe that mountain Kailasa is the birthplace of the world? They feel this way because there are four rivers that flow down its slopes into the four corners of the world. I’d love to see that, wouldn’t you? Be careful, though! According to the locals, setting foot on its slopes is a dire sin. You might die. That’d put a damper on the vacation, huh? Thought so. Remember how “The Bear Necessities” in Disney’s The Jungle Book mentions the pawpaw (prickly pear)? Well, Captain Bligh is credited with introducing that fruit to the people of Aitutaki in the Cook Islands. The Louvre used to be the world’s largest palace before it became the world’s largest art museum. Europe has its own Grand Cayon: Les Gorges du Verdon in France. The film, Chitty Chitty Bang Bang, was partially filmed in Neuschwanstein—the royal palace in the Bavarian Alps of Germany. PLEASE coach me on pronouncing that one! The beautiful British Museum is totally and completely amazing… plus, entrance is FREE! Good to know! Anyone seen the movie Leap Year? Part of it takes place in Beautiful Dingle. A dolphin named Fungie has lived in that harbor since 1984. Makes me want to visit even more now! Mount Athos, in Greece, is the treasury of the Greek Orthodox faith and only men can apply to enter! Men, if you’re interested be sure to apply at least 6 months in advance because only 10 are allowed to visit per day. Ok, seriously. Don’t miss Italy. I won’t even talk about Italy because then this post would be longer than the book itself. LOVE Italy. Spain has its own Guggenheim Museum! It looks just as awesome as the famous Guggenheim in New York. Our journey ends in the Middle East with a personal favorite: Jerusalem. Did you know that Jerusalem is also known as “the City of Peace”? Kind of ironic, considering it’s the most disputed city on earth. What did I tell you? Amazing! Doesn’t this make you want to jump on a plane and start exploring? 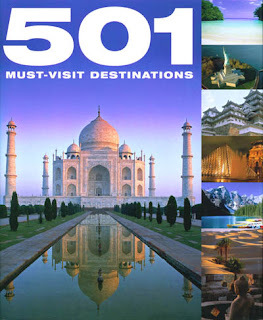 This book is 539 pages of dream vacations, and I would love to visit every single one of them. I have absolutely no complaints about this book, except I am really annoyed that it did not come with plane tickets and travel accommodations for each of these destinations. I mean, come on! I would recommend this book to any traveler, whether you’re experienced or just daydream about it a lot. I learned so much and spent forever looking at the amazing images, presented in full color (no B&W here!) and printed on beautiful glossy paper. I still can’t believe I only paid $10 for this! I’d give it a solid 5 stars. Oh, I've seen this book at Borders (and other incarnation of the 501 things series). I always liked flipping through it but never bought it. I've been to Dingle and it's beautiful...probably my favorite place in the world. I guess I just have 500 more to check out now!